Natural gas broke down from its short-term consolidation to signal that a continuation of the longer-term slide is due. Price could aim for the Fibonacci extension levels marked on the retracement seen on the 4-hour chart. The 100 SMA is still above the longer-term 200 SMA, though, so the path of least resistance might be to the upside. In other words, there’s still a chance for the climb to resume. However, natural gas is also trading below the 200 SMA dynamic inflection point to reflect the presence of selling pressure. The 38.2% extension lines up with the swing low or $2.600 mark while the 50% level is closer to the $2.500 minor psychological level. Stronger selling pressure could take natural gas to $2.400 or the 61.8% Fib or the full extension at $2.083. 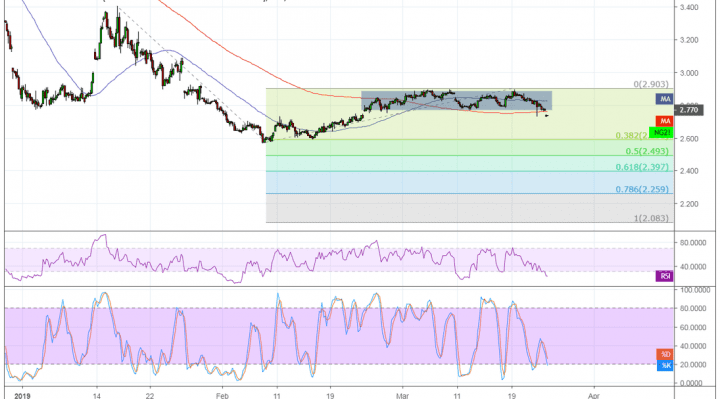 RSI is pointing down to signal that sellers have the upper hand, but the oscillator is dipping into the oversold region to indicate exhaustion. Turning back up could confirm that buyers are regaining control. Stochastic is also pointing down to indicate the presence of bearish momentum but is hovering close to the oversold area to show that sellers might need to take a break soon. Weather conditions have stayed cool across most parts of the country for the previous week and the forecast is for subdued temperatures for yet another week. Still, there’s no denying that warmer months are about to set in sooner or later, which means lower demand for heating commodities like natural gas. However, it appears that overall risk aversion in the markets has taken its toll on most higher-yielding assets, including commodities. The Fed shared a less upbeat outlook on the economy and leading indicators in the euro zone showed further signs of weakness, weighing on traders’ appetite for risk.